Sipadan Island and nearby Mabul are legendary among divers. Off Malaysian Borneo, these islands offer visibility of at least 60 feet (18 m), year-round water temperatures of between 82-86 F (28-30 C) and calm conditions, making most of the best sites accessible to divers of all skill levels. It’s also near-impossible to get lost. Most dives are drifts, either along a wall or a sloping coral reef, so dive with an SMB. Read on for a taste of the best dive sites in Sipadan and Mabul. The crown jewel of the area’s diving, Pulau Sipadan (Sipadan Island) offers a startling diversity of marine life. The island, an isolated seamount with a fringing coral reef, has been a marine park since 2003. Many shark species — grey reef, whitetip reef, hammerheads, the occasional thresher — visit local cleaning stations. Here, electric-blue cleaner wrasses pluck parasites from their bodies. Green and hawksbill turtles circle the island, snacking on coral and (from July to November) mating. Schools of jacks, snapper, surgeonfish, unicornfish, bumphead parrotfish, and others do their best to distract divers from the smaller creatures, such as squat shrimp bobbing their tails, leaf scorpionfish in flamboyant pink or mottled white and nudibranchs laying ribbons of eggs. Most of the best dive sites in Sipadan are wall dives, with the top of the wall sitting rather conveniently at safety-stop depth. One of the best is South Point. Here you’ll find lots of sharks and the best chance to see a hammerhead or thresher. Lovely soft corals cover Hanging Gardens, and you’ll lose count of turtles after around 30. That said, Sipadan’s true can’t-miss site is Barracuda Point. There’s simply nothing like being engulfed by a hundreds-strong funnel cloud of chevron barracuda. A number of dive sites have earned the small island of Mabul the reputation as one of the world’s premiere muck-diving destinations. There is little coral at sandy, rubbly AWAS, which means “caution” in Malay. Instead, fingered dragonets and flying gurnards flit across the mottled sand; skeleton shrimp, delicate ghost pipefish and juvenile frogfish conceal themselves in the seagrass; and pharaoh cuttlefish perform flashy, choreographed mating rituals. Right next door, Froggie’s (or Froggy’s) Lair is not the best place to find frogfish. Try Artificial Reef instead, a sprawling collection of purpose-sunk wooden boxes and towers that attracts a surprising variety of marine life, including all manner of frogfish. The highlights at Froggy’s, a shallow natural reef, are the baroque resident mandarinfish. At dusk, these notoriously jittery creatures pair up to soar into the water column and release clouds of sperm and eggs. After nightfall, spend time searching the edge between the reef and the sand for hungry crustaceans and cephalopods, including tiny bobtail squid. 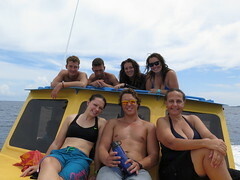 Mabul divers shouldn’t miss Sea Ventures, a dive site situated under the dive resort of the same name. The resort, housed in the decommissioned accommodations module for oil rigs, sits on pylons off the coast of Mabul. Its apocryphal origin tale offers the reason. A Malaysian businessman, angry at a rival who bribed his way to the building rights on land he had been promised on Mabul, bought the rig. He towed it from Singapore, painted it garish colors, and planted it directly in front of his rival’s resort. Whether the story is myth or truth, the dive site below, which resembles an underwater junk pile (but in a good way), attracts spectacular macro life, including pygmy seahorses, flamboyant cuttlefish and frogfish. Mabul diving isn’t all muck and junk, however. 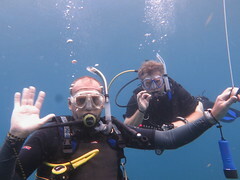 Eel Garden, a sloping coral reef that bottoms out at around 60 feet (20 m), is a lovely site that lives up to its name. Garden eels, of course, but also ribbon eels and snake eels abound. There are plenty of morays around as well. Kapalai is not so much an island as a submerged sand bar, ringed by a coral reef, with a resort built atop on pylons. While its House Reef has a few purpose-sunk “wrecks” and other structures, most of the action, critter-wise, happens on the coral reef. Don’t let the unimaginative site names fool you. First Beach is a muck-diver’s dream, worth every jarring moment of the one-hour (in good weather) speedboat ride from Mabul to the uninhabited island of Si Amil. The dive site’s ideal physiography — sand, rubble, some mucky parts, tufts of sea grass — attracts all manner of rare creatures. 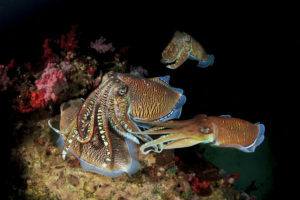 Sea moths, blue-ringed octopus, flying gurnards, zebra crab and wunderpus octopus all inhabit the site. Second Beach and Meditation Wall are more traditional dive sites, but still serve up the variety expected at Si Amil: rare nudibranchs, Halimeda ghostpipefish, octopus, bamboo sharks, and much more. The northern islands are accessible to divers staying in the rather dreary town of Semporna on “mainland” Borneo; they’re a bit too far from Mabul. But north-island diving can be worth a stopover. For one thing, you won’t see another soul, other than your dive buddies. In fact, Sibuan is the archetypical tropical island, where you’ll wish you were marooned with your celebrity crush. The diving off the shallow side of the island features great macro. The diving on the opposite side, which faces a deep channel, may yield mantas or devil rays. 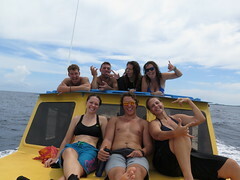 Other northern islands with great diving include Mantabuan, Bohayan, and the Post Box wreck at Mataking, where the first season of “Survivor” was filmed.